We are no longer accepting applications for the 2019 Secondary School Festival. Stay tuned for information on the 2020 Festival! 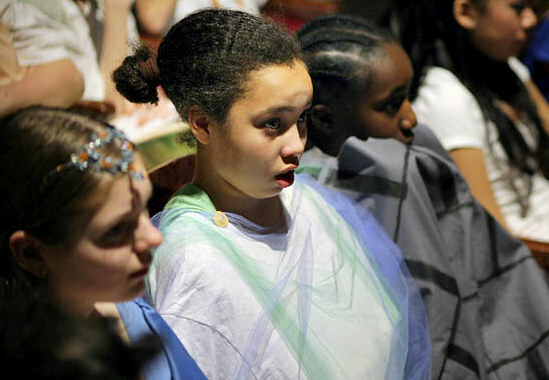 The annual Secondary School Shakespeare Festival is open to students in grades 7-12 who attend school in the DC, Virginia, and Maryland metropolitan area. Students come to the Folger for most of a day and perform Shakespeare for each other. Not a drama competition—or any kind of competition—the Festival magic is students sharing Shakespeare with one another. Performances run 20-25 minutes. Cut scenes from a single play or scenes on one theme are all wonderful. Text must be the real thing—in Shakespeare's original language. Shakespeare is a vibrant, passionate, human, hilarious, teachable, learnable, enjoyable playwright. Every student can connect meaningfully with Shakespeare and should have the chance to do that here at the Folger! Whether you are a 7th grader or a senior, in a school with no drama teacher or one with three, scared to death or in your element, Shakespeare is for YOU. And the Folger Shakespeare Library is, too. Festival days are designed so that students are each other's audience. Watching five other scenes is as educational as performing your own. Scenes from different plays are scheduled each day, so the students can come away with an idea of the range and texture of Shakespeare's work. We strive to schedule so that students from different geographies and different kinds of schools share the festival experience together. The world is an exciting and diverse place; we need to know one another. Students take ownership of Shakespeare by acting as their group's director, editor, stage manager, and other positions on or off stage. We expect that students within each group will take on all or some of these tasks. The Festival is fun! All students will go home with a tangible token of the day whether they trod the boards backstage or onstage. Commentators offer encouraging feedback and present recognition awards for excellence of every kind. We want students to have a good time, a great time, maybe the time of their lives. In order to enhance all of the Festival's educational goals, we continue to make changes to certain areas of the Festival, as outlined below. To foster greater collaboration among Festival participants from different schools, students will be asked to comment on one another's performances (see below). The application will ask for a full list of student contributions to the work, besides acting. It is important to us that students are also directing, editing, stage managing, leading language work, and more. Our commentators are fewer in number and will provide encouraging comments and constructive ones, such as "if you are going to keep working on this, here are a couple of areas to focus on...” Commentators will give brief comments after each performance, and will ask for responsible comments from the students in the audience. Each school will be asked to provide a short synopsis of their play as part of their broadside program. Lastly, upon acceptance into the Festival, each participant will be required to submit release forms, so that we may take photographs and video during the Festival. With special thanks to the Washington Square Press at Simon & Schuster, Inc.
Additional support received from the Nancy Peery Marriott Foundation and generous donations from individuals. Questions? Check out our Festival FAQ, or contact Director of Education Peggy O'Brien at pobrien@folger.edu.